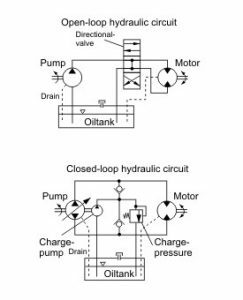 There are different types of hydraulic circuits used in fluid power applications. The two types are described as Open Loop (or Open Circuit) and Closed Loop (or Closed Circuit). 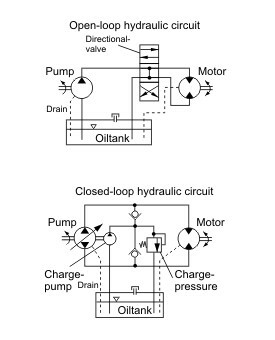 These are circuits where both the inlet to the hydraulic pump and the motor (or valve) return are connected to a hydraulic reservoir. The hydraulic flow from the pressure port on the pump is directed to the device that it is powering and then returned back to the reservoir. A relief valve or directional valve in the circuit may divert any unused fluid back to the reservoir. Suction strainers and return filters keep the fluid clean. Better for lower pressure applications (below 3000 PSI). Simple to maintain and easier to diagnose problems if they occur. Could create heat in the system if working pressure exceeds the relief valve setting when using fixed displacement pumps. Reservoir size has to be larger for adequate cooling of the fluid. These are circuits where the motor return is connected directly to the hydraulic pump inlet. To maintain pressure in the loop, the circuits have a charge pump (a small gear pump) that supplies cooled and filtered oil to the low-pressure side. Closed-loop circuits are generally used for hydrostatic transmissions in mobile applications. The reservoir only has to have enough capacity to feed the small charge pump. These circuits are mainly used with higher-pressure piston hydraulic pumps and motors. Systems can run at higher pressures with less fluid flow so smaller hydraulic lines can be used. Direction can be reversed without the use of valves. More control options are available. More expensive components are used. More difficult to diagnose and repair. Many of the Hydra-Tech Pumps systems use open loop circuits with high efficiency pressure compensated hydraulic pumps to help prevent heat build-up while offering ease of maintenance that is so important in the field. Examples of open and closed loop circuits.